Stopgap is a marketing recruitment agency, which started in 1993. They were the first recruitment company to focus on the diverse and dynamic world of marketing and digital. 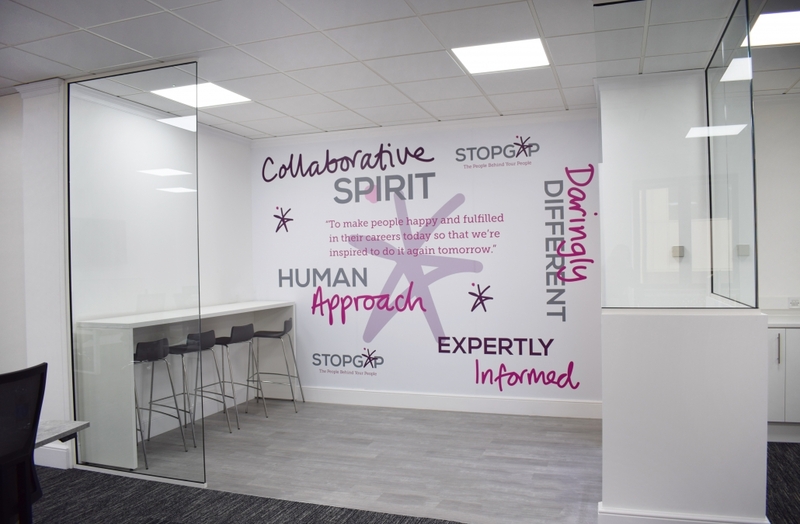 Stopgap chose to partner with Office Changes, who completely revamped their old, tired office into a bright, modern space in Richmond, Surrey. Wanting to stay in their office, Stopgap wanted to create a space showcasing their branding and add some character to the office. 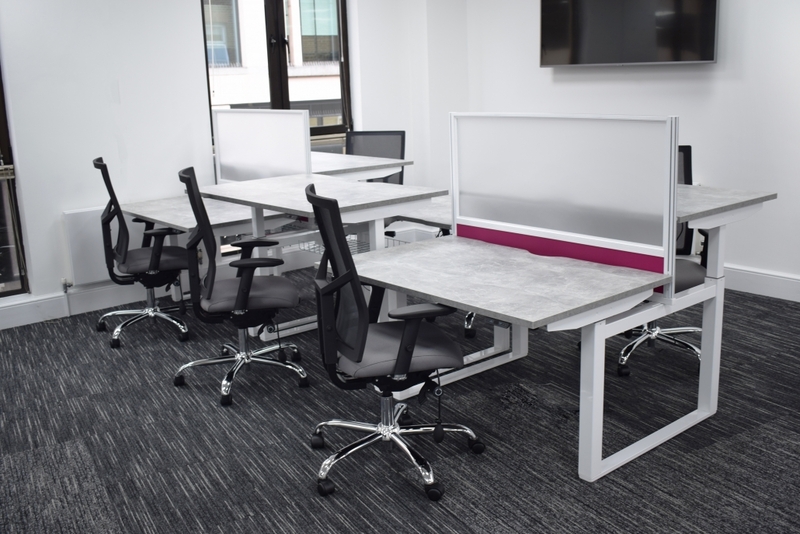 Office Changes was able to design and create a functional, modern office that accommodated to all employees, completed with sit-stand desks with a concrete MFC desktop finish, complimented with Perspex desk screens and pink fabric. Opting for sit-stand desks creates a more flexible space for staff, giving them the option to sit or stand while working. We incorporated lockers into the design, where employees can store away personal items and any equipment they may have to lock away overnight. We decided to finish the lockers with a random lay design using Stopgaps branding colours on some of the doors, so it wouldn’t overpower the rest of the office design. Finishing the design off with a brand new drinks area, for the Stopgappers to enjoy their Friday afternoon drinks! The Office Changes team thoroughly enjoyed taking on this office fit-out project for Stopgap, we are so happy with the end result and we hope that Stopgap enjoys their new home! 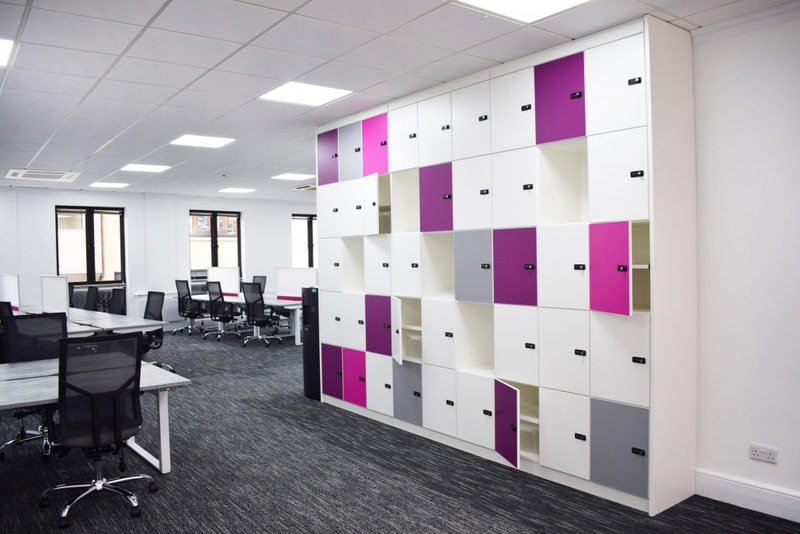 If you are looking to fit-out your office space and you need some help and guidance, please do not hesitate to get in touch, call us on 01444 474278 or email info@officechanges.com. WHY SHOULD YOUR OFFICE HAVE GLASS MANIFESTATIONS? BRIGHTEN UP THE WORKPLACE WITH THE NEW DESIGNER FINISHES!